Global innovation firm 3M has broken ground on the first phase of what will by 2020 be its largest manufacturing facility in the Middle East and Africa. The flagship plant, the US-headquartered company’s first manufacturing investment in Saudi Arabia located in Dammam’s Third Industrial City, will make what 3M describes as “cutting-edge products created from new and innovative projects” and will serve customers both in Saudi Arabia and the wider Middle East and North Africa (Mena) region. The $30 million first phase is expected to be operational by the first quarter of 2017. The company says its strategic investment will create “sophisticated” job opportunities for Saudi nationals, while transferring knowledge, technology and expertise to the kingdom. By 2020, the site is expected to employ as many as 500 technical personnel, a large percentage of them Saudi nationals. 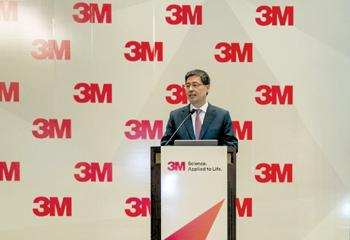 3M’s latest strategic investment in Saudi Arabia comes against a backdrop of low oil prices and tight GCC markets. Speaking at the groundbreaking ceremony, HC Shin, 3M’s executive vice president for international operations, acknowledged the current macroeconomic headwinds but struck a positive note about Middle East prospects. “Yes, we are going through some setbacks in terms of the oil price, but 3M thinks this will be temporary and that the region, particularly Saudi Arabia, will continue to grow,” he said. First phase construction will now be accelerated, with a view to starting mass production from spring 2017. “It is an aggressive timeline,” Shin conceded. “We have to complete the building, bring in equipment, bring in all the processes (including quality control based on 3M standards), start making products and getting them out to customers for test sale and qualification, all ahead of the start of mass production from Q1 of 2017. The new facility will complement 3M’s existing presence in the kingdom, which it has served since the 1980s. It has a Technical & Scientific Office, two Customer Experience Centres and a Learning Centre in Riyadh, Jeddah and Dammam. In addition to breaking ground on the new manufacturing facility, 3M executives also recently opened a new R&D centre in Dammam to support its manufacturing functions. To date, 3M has not defined a start date or scope for the project’s second phase. Bruce Hafermeyer, manufacturing manager, 3M Saudi Arabia, and Al Rasheed signed the agreement for the plot that will house the new facility.